Ali Haidar has a job title that may sound more like a pipe dream than an official post. But Syria's new minister for national reconciliation said he believes the country can still unite for a political solution - even after two years of incessant bloodshed and more than 92,000 deaths. In an exclusive interview with CNN's Frederik Pleitgen, Haidar said all parts of the Syrian government should be up for negotiation. The Syrian National Coalition, the country's principal opposition group, says it is suspending its participation in the upcoming Friends of Syria conference in Rome "in protest of the shameful international position." After a missile shelling that killed dozens in Aleppo on Friday, the group said on its Facebook page that it "considers the international silence toward the crimes committed every day against our people is, in effect, participation in the ongoing slaughter for the last two years." What we saw during our trips in Aleppo were not images of the city I knew: The shelling, the snipers, the destruction. I never imagined this city would be standing in the middle of warfare. Nobody imagined it would turn into this. Some parts of Aleppo are complete battle zones. Shells and rubble litter the streets. Cars are blown to pieces. This beautiful city is where we raised my daughter for her first years from 1990 to 1993. When I was at work my wife went everywhere shopping with my daughter and going to markets. 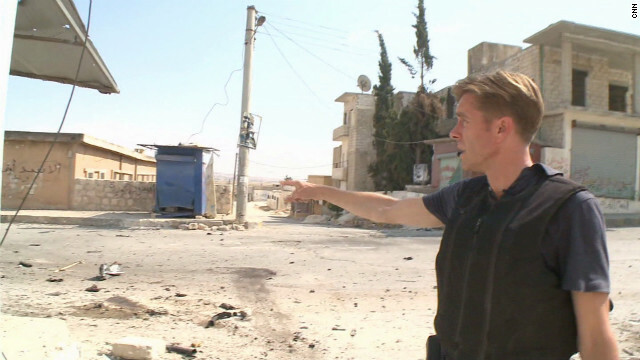 Editor's note: CNN's Ben Wedeman and crew are some of the few international reporters in Syria, whose government has been restricting access of foreign journalists and refusing many of them entry. Wedeman spent two days this week in Aleppo, a city of more than 2 million people where rebels and government forces are fighting. Below is an edited account of what Wedeman saw in Aleppo, including his harrowing trip into the city past snipers, street vendors selling their wares as bombs fall, and a lack of enthusiasm for the rebels' battle among many civilians. The crack of sniper fire welcomed us into a rebel-held part of Aleppo. Traveling through a back road on Monday, with six people crammed into a small car, we drove through government-controlled territory, bypassing a checkpoint and rolling right past the military intelligence headquarters. Vendors sold tea and coffee by the side of the road, with traffic fairly normal. Traffic was noticeably less as we approached a rebel-held area, one neighborhood over from the Salaheddine neighborhood where fierce fighting has raged. As the car passed an intersection near a Free Syrian flag, three or four shots rang out, apparently at the vehicle. No one was hurt, and once the vehicle passed the intersection, rebel fighters nearby shouted for the driver to stop. “There's a sniper right there. What are you doing?” they said. The sniper apparently was part of the government's forces. CNN’s Ivan Watson reported from northern Syria on Sunday, where he witnessed rebel fighters launch an offensive against a Syrian army base north of Aleppo. “The offensive began around sunset, and we’ve been watching a constant stream of tracer fire emerging from the location where the Syrian army base is,” Watson said. Aleppo is a key city in the ongoing battles between the Free Syrian Army and President Bashar Al-Assad’s regime. It has been embroiled in bloodshed since since rebels burned a police a station and spurred fights in the city Wednesday. In response, the Syrian government launched a violent offensive on Saturday. CNN's Ivan Watson reports from a battle-scarred Syrian town where the civilian population has fled. As the months-long violence in Syria engulfs two key cities, Damascus and Aleppo, CNN's Ivan Watson has been traveling through villages in the area. He and the crew are some of the few international reporters in Syria, whose government has been restricting access on foreign journalists and refusing many of them entry. Check out more from CNN inside Syria. CNN: We're hearing that one community in Syria - the ethnic Kurds - are beginning to take matters into their own hands. They're breaking with the regime. What are you seeing? What are the signs that this could impact the entire conflict? Syrian rebels: Guns, mortars ... and mansions? Editor's note: CNN's Ivan Watson and crew are some of the few international reporters in Syria, whose government has been restricting access on foreign journalists and refusing many of them entry. Check out more from CNN inside Syria. A distant machine gun rattled away in vain as a military helicopter flew long, slow circles, arcing from the contested Syrian city of Aleppo over to the rebel-controlled town of Anadan, six miles to the north. A group of fighters stared and pointed from under the shelter of an overhanging building, until one man said in a worried tone, "Let's go away" before hurrying indoors. In a matter of months, Syria's rebels have transformed themselves from ragtag village defense forces into an armed movement capable of attacking the country's two largest cities, Aleppo and Damascus. They have also punctured the image of invincibility projected by Syrian army tanks and armored personnel carriers, as proven by the twisted wreckage of armored vehicles that now litter some roads. But the fighters still find themselves vastly out-gunned when facing government air power. And yet, even that advantage may be shrinking. Rebel-controlled northern Syria (CNN) - Mohamed Rashid walked out of the gate of his house with a giant blood stain on his white T-shirt. "This is the blood of a martyr! Of a hero! Of a lion!" he bellowed. "This is his blood. It is pure!" The younger Rashid is one of the casualties of the five-day-old rebel offensive on Aleppo, the country's commercial capital. Another rebel, who asked only to be named "Khorshid" because his wife and children were still living in Aleppo, described how his comrade was killed by a helicopter gunship, while climbing onto a rooftop. "Housam's specialty was a sniper," Khorshid said. "He went to the roof, and a helicopter gunship killed him. Another fighter from Aleppo with him was also killed. I was just 4 meters away when it happened." Atareb, Syria (CNN) - After months of fighting, the regime's men finally abandoned this strategic crossroads. Fighters had renamed the stretch of the Bab el Hawa highway, which ran through the center of town, the "Street of Death." Until recently, they said anyone who dared set foot on it became a target. A mini-graveyard of burned-out armored personnel carriers sat next to the main municipal building, which served as a base for government soldiers. Several weeks after rebels captured the town, the building's walls were still decorated with pro-regime graffiti proclaiming frightening ultimatums: "Either Bashar or we'll burn this city" and "Bashar or nothing." "This used to be a very classy area. ... The Turks would come here to see our village," said a fighter named Abdullah Behri, who was treated in a hospital in nearby Turkey after losing his left eye to shrapnel during a battle here last May. "Now it has all turned to hell," he said, pointing at the town's deserted streets. Members of the Syrian opposition say one of their greatest weapons is using technology to show the world what is happening. Editor's note: Syrian forces are intensifying their bombardment of the Baba Amr neighborhood of Homs, a stronghold of the opposition. For those trapped in the area, there is the ever-present danger that the next shell will hit wherever they are trying to find shelter, or a sniper's bullet will kill them. The weapons are different here. They come in the form of protest banners, videos and anti-government demonstrations. And they are images that are broadcast and streamed live online to the outside world. Young men are among the activists that have kept the Syrian uprising alive by using technology in the face of a government crackdown that's left thousands dead. 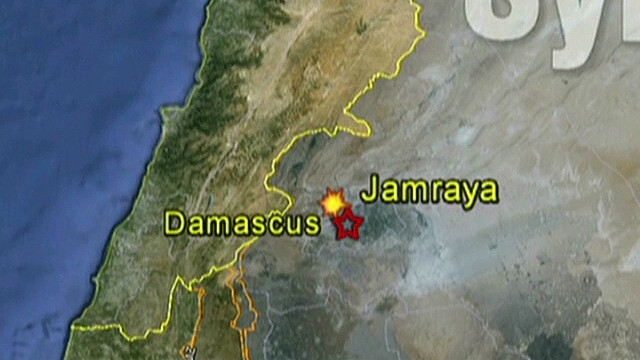 The Syrian regime says they are facing a barrage of attacks from armed terrorists. They are fighting back, but these revolutionaries insist they don't need guns. "I don't need Kalashnikov. I need just this [holds up camera] and laptop and media," Shaheb Sumac tells Watson. They arm themselves with these pieces of technology and a whole lot of bravery. They show CNN footage they've shot secretly. And then they distribute them across Syria and throughout the world. This amateur footage has served as a lifeline into life in Syria as it has become an important source of information for news organizations, including CNN, which are barred from freely working inside the country. At first glance, the media operation appears like a grungy Middle Eastern university dorm room. But in their eyes, these men are media warriors. "We are fighting a war against the regime's media channels," Alaa Edien Hamdoun, the group's leader, tells Watson. Even though we're working for free with few resources ... we are winning against them ... because we are servants of our revolution who are demanding freedom." Editor's note: CNN correspondent Arwa Damon recently spent some time in Baba Amr, a neighborhood in Homs, Syria, a city that has been a flashpoint in a months-long uprising against President Bashar al-Assad. Government forces have shelled parts of the city - especially Baba Amr, a bastion of anti-government sentiment - for more than two weeks, damaging houses and other buildings and leaving many dead and wounded. Virtually no food has come into Baba Amr since the shelling began more than two weeks ago, activists say. So, the residents who are gathered in makeshift bunkers collect what food they can find there and carefully ration it - though those supplies are running out. Some of what they’ve gathered comes from, among other places, stores that have been hit by artillery fire. “We take the products to distribute so they don’t go to waste. We keep track of everything we took to reimburse the owners,” an activist says. Editor's note: CNN correspondent Arwa Damon reported from Baba Amr, a neighborhood in Homs, Syria, a city that has been a flashpoint in a months-long uprising against President Bashar al-Assad. Government forces have shelled parts of the city – especially Baba Amr, a bastion of anti-government sentiment –for two weeks, damaging houses and other buildings and leaving many dead and wounded. This small hall was once filled with laughter. Marriages took place here. Now the echoing sounds are not of joy, but of tragedy. In this makeshift bunker, some of the families of Baba Amr who have nowhere else to go huddle. But, it offers them very little comfort. "We're not sleeping at night, we're not sleeping during the day," a man named Ilham howls. "The children are always crying, the bombs are coming down." Often they huddle in near darkness. In hard-hit Baba Amr, about 350 people who've fled their homes out of fear or necessity are living in the makeshift bunker. Restricted by seemingly constant shelling and gunfire outside, they don't have any medicine, let alone the ability to get to a hospital. Children are getting sick, and one woman recently gave birth there. They have little food – some lentils and rice and a little bread. They fled here either because their homes were destroyed by shelling, or because the firing was getting too close.